The two-day (September 5 ,6) Peasant Convention organized in Multan by the Human Rights Commission of Pakistan (HRCP) has made a strong plea for land reforms , development of equitable land utilization policies, mitigation of the hardships of landless tillers of the soil, acceptance of the tenants‘ rights that have been settled for long on lands leased to the military, fixation of a fair return to farm labor, effective action to eradicate bonded labor, protection of rights of women working in agriculture sector ,a peasant-friendly policy for distribution of inputs and for marketing of the farm produce. The convention was attended by representatives of Kisan/Hari committees from the different parts of the country, peasant activist representatives of bonded /liberated workers, and human right activists. The convention declared that the demand for land reform was justified in the country’s economic interest, the right of the vast rural population to social justice and the basic requirements of a democratic dispensation. Studies by economists had established that the skewed land ownership pattern in the country was hampering economic growth and spread of education, besides increasing the areas of mass poverty. An economically and socially disadvantaged peasantry was also unable to support a democratic order. It was necessary to ensure, the convention declared, that the proposed land reform is the sincerely and efficiently implemented, small owners and landless cultivators are enabled to acquire at least subsistence holdings, and women cultivators, especially in case of women-headed families, are duly accommodated. The convention called upon all the provincial governments to evolve both short and long term agricultural policies, including land utilization policies. The practice of giving away land as a reward for dubious and controversial services to the establishment should be discontinued. No allocation of land for commercial exploitation should be allowed. Land must be given only to cultivators and the system of absentee landlords completely eliminated. The practice of allowing urban/industrial projects on fertile lands also needed to be reviewed and unnecessary and haphazard contraction of farm area stopped. Whenever land is acquired for non-agricultural purposes the tenants that are displaced should get a part, may be 25%, of the compensation allowed to the land owner. The land utilization policy should also address the ecological disasters being caused by wanton destruction of forests. The convention was of the view that all the provincial tenancy laws needed to be revised with a view to providing firm and clear guarantees for tenants’ rights, closing all gaps that permit exploitation of tenants, and adjudication of landlord –tenant issues by special Hari courts. As regards landless tenants, the convention demanded allotment of land to the largest number possible, and effective safeguards against ejectment of tenants. The tenants should be helped with credit under new and liberal lending policies. Those who cannot be kept on farms ought to be enabled to develop alternative skills in towns near their homes, and provided with meaningful employment. The participants of the convention strongly deprecated the government’s failure to recognize and protect the rights of cultivators who have been working on military farms for many generations. They hailed the struggle of peasant organizations in resisting attacks on their rights and called for immediate transfer of ownership to cultivators of military farms in Okara, Khanewal, Sargodha or anywhere else. The convention expressed concern at the absence of any framework for guaranteeing fair wages for farm labor and urged an expeditious solution to the problem. At the same time it was necessary to take effective steps for the elimination of bonded labor and rehabilitation of liberated workers. The participants were unanimous in demanding steps to ensure easy availability, at affordable cost, of the essential farm inputs, especially water and seeds. The peasantry suffered a great deal due to an unfavorable system of marketing of farm produce. A fair and equitable marketing system needed to be installed in consultation with representatives of the cultivators. The convention expressed serious concern at the widespread and multi-dimensional exploitation of women associated with and dependent upon agriculture. In several areas of farming and cattle-breeding, women contributed more than men but were denied due recognition of and reward for their work. The convention called for a broad based movement o secure the rights of women engaged in agriculture. The convention appreciated the work done for the peasantry’s uplift by the various kisan and Hari committees, peasant and tenant associations, human right activists and alliances and called for closer collaboration among them so as to generate a strong movement for justice to the country’s large agricultural community. The convention also urged upon the state, the political parties, trade unions of industrial labor and all other elements of civil society to facilitate unionization of the agricultural labor in accordance with the ILO conventions and guarantees inscribed in the constitution of Pakistan and international instruments. The other demands made at the convention included a call for recognition of the right to work, women’s’ right to equal wages, and all citizens’ right to social security as fundamental rights. The convention called upon all political parties to give the peasantry’s interests and concerns a prominent place in their manifestos and programmes. At the same time it appealed to the entire peasant community to play their due role in the coming elections and seek assurances from all candidates that they would work for the realization of their rights. It was time the peasants served a notice on all concerned that they were determined to have their say in governance and equitable management of their affairs. Today, 16 August 2012, FIDH Deputy Secretary General, Nabeel Rajab, was sentenced by the Bahraini Lower Criminal Court to three years imprisonment for “involvement in illegal practices and inciting gatherings and calling for unauthorised marches through social networking sites”, for his “participation in an illegal assembly” and for his “participation in an illegal gathering and calling for a march without prior notification”. FIDH strongly condemns this sentence and calls for his immediate and unconditional release. On the same day, the Higher Appeal Court also decided to postpone the verdict in the appeal against the decision of the Lower Criminal Court which had earlier sentenced Nabeel to 3 months imprisonment for alleged libel after he tweeted on 2 June 2012 a message asking for the Khalifa to step down. The verdict is now expected for 23 August. The International Federation of Journalists (IFJ) and its affiliate the Pakistan Federal Union of Journalists (PFUJ) are deeply saddened by the suicide of a young journalist in Lahore following her employer’s refusal to pay her salary. Ms Semaab worked for local Lahore newspaper Daily Anti-Crime. She was the sole financial provider for her family including younger siblings and her father who requires regular medical treatment for cancer. According to reports, Ms Semaab jumped from the fourth story of the hostel where she lived with her family on August 15 following the newspaper management’s persistent refusal to pay her salary for several months. The PFUJ and IFJ extend its deepest sympathy to the family, friends and colleagues of Ms Semaab. Tragically, Ms Semaab’s commitment to journalism was undermined by the very media organisation she worked for. The exploitation of media workers in Pakistan is all too common. According to the PFUJ, media organisations including Khabrain, AAJ TV, News 1, TV1, Royal TV, Wasaib, Channel 5 and Indus TV are known to withhold employee salaries. In similar incidents over the past 12 months, journalists working for Channel 5 and Aaj TV committed suicide after their employers withheld salaries for several months. In a statement, PFUJ Secretary General Amin Yousaf demanded media owners stop exploiting their workers and called on the Supreme Court Chief to take notice of this tragedy and direct the media owners to pay salaries to their workers. The Seventh Wage Award for journalists and newspaper workers in Pakistan, announced in 2000, guarantees conditions and wages under which journalists are employed in Pakistan however, the government and Wage Award Implementation Tribunal have failed to implement the statutorily determined level of wages for journalists. Journalists are increasingly employed without a contract or under short term contracts which are not accountable to the Wage Board. “The death of Ms Semaab draws acute attention to the plight of exploited media workers in Pakistan” said IFJ Director Jacqueline Park. The PFUJ, in partnership with the IFJ, recently deployed four missions to assess the situation for journalists in Balochistan, Interior Sindh, the Khyber – FATA region and Punjab. The PFUJ/IFJ report on the State of Journalism in Balochistan Province, released on World Press Freedom Day 2012, is available on the IFJ website here. As you may know, 19 August is World Humanitarian Day. Every day we see and hear images and stories of human pain and suffering – in our own neighbourhoods or in countries far away. We believe we can all do something about it, and that together, we really can make the world a better place. We are turning to you to get your organisation’s support for the campaign. 1. Please ask all your staff to join the campaign to support WHD through their personal Facebook, Weibo, or Twitter accounts. 2. If your organisation has a Twitter or Facebook account, sign your organisation up to the campaign, using whichever account has more followers. Through the technology of Thunderclap, all your followers will be added to the total number of people reached. Islamabad, August 12: Pakistan’s survival depends on strengthening the democratic process so as to remove the tensions and imbalance in civil and military relations and ensure that all institutions of the state play their role in the well being of the people within their parameters. This was the consensus at a consultation organized by the Human Rights Commission of Pakistan (HRCP) here. The consultation on ‘civil-military relations and their impact on human rights’ was attended by politicians from across the political spectrum, former military officers, representatives of civil society, noted academics and journalists. The assembly passed the following resolution at the conclusion of the consultation. 1. Pakistan’s survival lies in strengthening the democratic process and it cannot flourish without the existence of a strong parliament or an independent judiciary. The country needs both. However, recent events are disturbing as the authority of the parliament has been undermined and its lawmaking power challenged. All laws that are in contravention of fundamental rights ought to be struck down by the courts but they cannot put restrictions on the parliament to enact laws. 2. An independent judiciary and an efficient system of administration of justice is the backbone to any democratic structure. In order to further strengthen the judiciary’s independent character, political parties should consider the establishment of a Constitutional Court as promised in the Charter of Democracy that was signed by the two major political parties of the country. After the adoption of the 18th Amendment and the creation of new relationships between the federation and the units, establishment of such a court has become imminent. 3. There is an urgent need for ensuring transparency in revenue collection and use of resources. In this regard all institutions of the State, including the various branches of the executive, the military, the intelligence agencies as well as the judiciary, should be made accountable. 4. The military’s service to the country cannot be denied. It has hugely suffered in the last few years while fighting terrorism but it must maintain its professionalism, among other things, by winding up intelligence work of political nature and its business enterprises which are not only an unnecessary burden on the economy but also distract the military from its professional duties. 5. Considerable damage is being caused by the gap in the understanding between military commanders on one side and civilian authorities and civil society on the other regarding the direction that the country ought to take. It is essential that the two sides engage in mutual discussions and find ways to move forward. 6. The situation in Balochistan is extremely critical and offers the most grave example of imbalance in civil-military relations and their impact on human rights. It is vital that political leadership of all shades addresses this critical situation seriously and with due diligence and sobriety. For harmonious civil and military relationship and promotion of human rights, it is absolutely essential that the political parties contribute to the growth of democratic culture by democratising their own party apparatus. 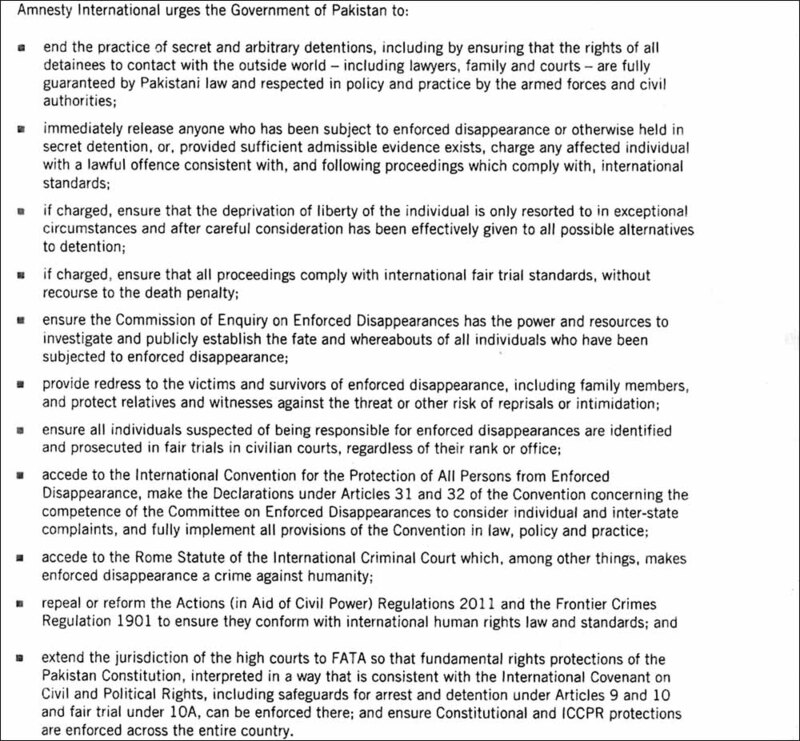 It is vital that political parties address human rights issues more seriously, especially enforced disappearances, oppressive laws in FATA and PATA, and the widespread acceptance of torture. The political parties must take a holistic view of parliament’s sovereign rights by giving priority to the people’s needs and aspirations, addressing foreign policy issues, and accepting ownership of and responsibility for allpolicies and decisions. 9. Legal cells may be created in all political parties so that they can better perform their legislative responsibilities and enable the parties to take their task more seriously. 10. All political parties must ensure that the forthcoming elections are held in a free atmosphere and that no agencies, not even security and intelligence services, interfere in this process. It is equally important that political parties do not invite unnecessary interference of the judiciary in the election process. All political parties should pledge that women will not be restrained from exercising their right to vote and the parties will not be part of any scheme to deprive women of their right to franchise. 11. The state, the political parties and civil society should have zero tolerance for any form of militancy. No one should remain silent where it becomes evident that any state functionaries or political elements are throwing up, protecting or colluding with militant elements. 12. The practice of doling out discretionary funds to parliamentarians should cease. This has corrupted politics and given rise to nepotism. The politics of giving plots to bureaucrats and judiciary must also be discontinued. 13. It is regrettable that Mr. Farhatullah Babar’s bill on the need for regulating the functioning of intelligence agencies that was submitted to the Senate had been withdrawn. The measures visualized in the bill need to be debated by political parties and consensus developed on regulatory frameworks which the state needs more urgently than ever. Equally important is the establishment of an efficient accountability mechanism which can oversee the working of all institutions of the state. 14. It is necessary for the development of healthy political traditions that the political parties that have in the past supported dictatorial regimes should own their mistakes and offer apologies to the people. 15. The adoption of the 18th and the 19th constitutional amendments does not mean that the process of constitutional amendment has been exhausted. Constitutional reform should be continued until the 1973 constitution is revived in its original form. There is need to delete articles 62 and 63 inserted by General Zia-ul-Haq, which allowed decisions to be taken on subjective considerations. It is also necessary to streamline the provisions/regime of the Supreme Judicial Council and continue the process of recognising more rights of the people as fundamental. A parliamentary committee on trade should be established to make the parliamentarians more aware of and more involved in dealing with the economic challenges facing Pakistan. At suggestions from the audience the conference agreed that all vacancies of judges in all high courts should be filled on merit. While the resolution was supported unanimously by participants, the representative of the Jamaat-e-Islami exercised his right to dissent from the clauses referring to the judiciary and the demand for deletion of articles 62 and 63.